You cant beat a good old traditional recipy with smell's and tastes that will take you back to you're childhood. Lightly butter a 2-litre baking dish. Butter the bread, remove the crusts, then cut each slice into 2 triangles. Arrange triangles in layers in the dish, then sprinkle the sultanas in between layers. Don't put any sultanas on the top layer as they will burn. Whisk together the eggs, egg yolks and caster sugar. Place both creams in a saucepan with the vanilla pod and seeds and bring to scalding point. Pour cream over the egg mixture and whisk lightly to combine. Strain mixture over bread slices, making sure not to dislodge them. 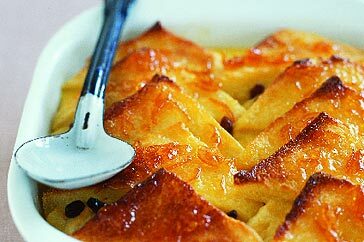 Set pudding aside for at least 30 minutes - this ensures that the pudding will be light and not stodgy. Place the baking dish in a large roasting pan and pour enough boiling water into the pan to come halfway up the sides of the baking dish. Heat the marmalade in the microwave for about 40 seconds or in a small saucepan over low heat for 1-2 minutes until spreadable. Remove pudding from oven and use a pastry brush to spread marmalade over top. Return to oven for 2-3 minutes, then serve immediately.